I was surprised at the response I got from yesterday's post about Pottery Barn's bundle of books with their covers torn off and pages glued shut. Pottery Barn isn't the only ones jumping on this band wagon though. Restoration Hardware also had ripped up books, although they are no longer available. Ballard Designs jumped on the bandwagon too with their bundle of books selling for $25. I found a nice alternative! "When a book is not a book, it had better be something special. 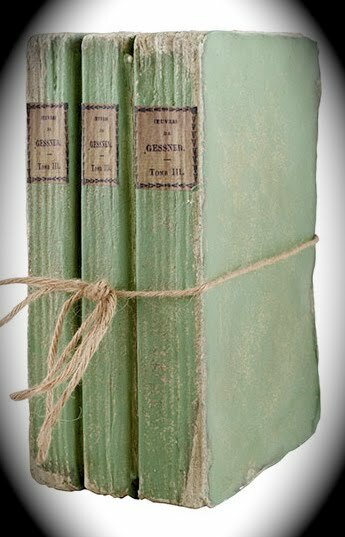 We created these books to resemble a stack of vintage French books so you can hide things in plain site!" 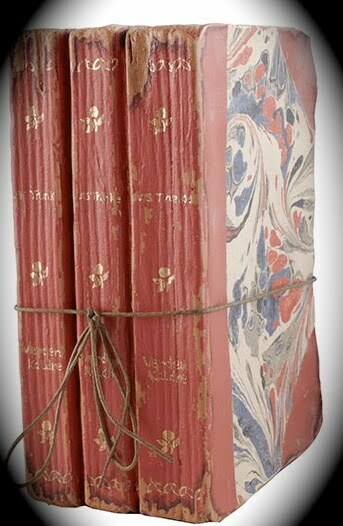 I especially like their red bundle of books with the marbleized cover. How cool would these be on the nightstand holding trinkets or glasses. I can't believe how authentic they look too. They're a little spendy at $49 though. However these green ones are on sale for $29. I think these are pretty special and would make a great gift! I could definitely get my mind around these vintage looking, multi-tasking bundles! A final thought about this subject: The response I got from yesterday's post was very interesting. Almost everyone passionately agreed that the idea of ripping up books so they fit into our decor was absurd. Dining Delight summed it up perfectly: "With the introduction of all the new "techno-type" books and downloading books to read on computers, I have a feeling actual books with real covers and pages will eventually become a thing of the past. We should treasure books of all kinds and not be tearing off covers and gluing pages together as a decorative trend!" I agree with Dining Delight too. 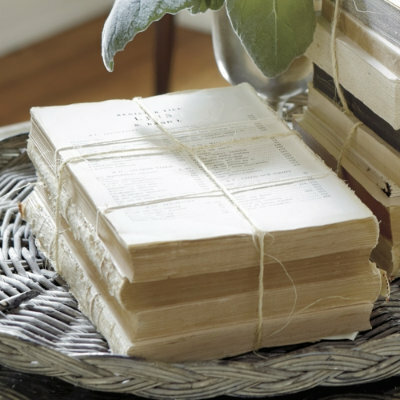 I love the look of old books stacked and tied. I just read your previous post and think it's really just plain stupid to take books (vintage, no less!) and rip the covers off and glue the pages shut. I mean...another fad that will go away, but the books can never be appreciated again. Your blog is beautiful, btw! That is as bad as drilling a hole through the middle of a stack of books and making a lamp out of them. I've just been going through a few of your older posts and have a question. Since I love clocks and birds, I fell in love with your little round enameled clock with the bird on it. Can you tell me where you got it, or who it's made by? I'd love to get one for myself. The Wisteria ones are a much more creative and a believeable look- how nice they offer a plus with hidden storage! Can't go wrong with that! Being one not to fall for every trend that Pottery Barn and the like want us to embrace, I MUCH prefer the look of regular books...such as your BOOK CLUB TABLESCAPE on your sidebar. It is beautiful, classy and plenty of texture, along with those beautiful bookends. The printing and engraving on some of the old books and their covers is so beautiful and intricate. It is definitely a lost art form with all the paper backs we have now. I wonder what Pottery Barn did with all the covers??? A great post summing up yesterdays post. I do like the made to look old storage books, yet they still lack the smell of old paper and the feel along with knowing that they are not real books. I just love displaying books and accessories in my home with history behind it. Delores this past postings have been eye openings to many of us who saw no harm in a design trend to maybe rethinking a motive we had for design trend. I have found books at flea markets with a back cover on it but the front cover was missing. If it is a book of my taste I have no problem buying it and displaying it with my other found objects of desire. I really fear what technology will do to books, as well as visiting book stores and libraries... Making it all to easy to DOWNLOAD!! I repeat beautiful eye opening post!! I agree. I am not ripping the covers off of books just for a decorating trend! Delores, I am so flattered that you used my quote to end your post today! It is certainly an interesting topic you've introduced and I've enjoyed reading everyone's responses. I think your posts on this subject have been very thought-provoking and made some of us think twice about what we are decorating our homes with. However, I can fully embrace those Wisteria "hidden storage" books, that's a great idea and I like their product description too. Thanks also for stopping by my blog and for your kind comments! How very interesting. I did not know that all these antique books were being sold as decorations. Funny though, I cleaned out my storage room yesterday and found my antique books, that I will now use for decorating no ripping up neccessary! I just found your blog and certainly will become a follower. I think books will be with us for always. While there are so many new ways of viewing books, they cant compare to touching a book, folding a page back or even curling up by the fire. Sometimes I use books for decoration. As a technology librarian I have been given a Nook Color e-reader and an Apple iPad so I can demonstrate how to download e-books from our library's website. It's official. Nothing will ever replace a real book for me. I rarely comment on blogs, but must comment on yours. Again..thank you for discouraging the destruction of printed books. Loving your Blog as always.. Those books are eveywhere-you are so right. We carry some similar in our shoppe- but always love Inspiration.. That bandwagon is a growing. 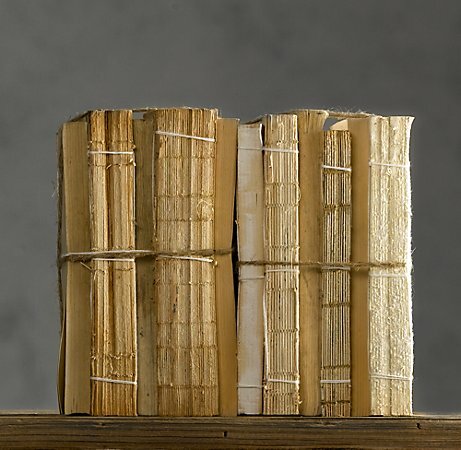 I had friends that coveted this decorated books three in all bound together and made to look old with various papers. They were originally $175 which was outrages. Eventually she marked them down to $90 and my friend bought 3 and got them for 70 ea. and gave them as presents to the other "coveters" She was thrilled thinking she got a steal until I told her they were $45 at the wholesale market. And I thought that was insane. Still can't believe she paid $210 for this books! crazy! You and Dining Delight sum it up perfectly.